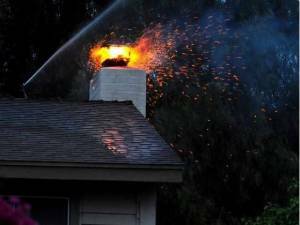 Clean chimneys are safe chimneys and clean chimneys don’t catch fire! When was the last time your chimney was cleaned? Safety experts recommend having masonry and metal chimneys inspected once a year and cleaned to prevent dangerous creosote build-up. Chimney cleaning services are listed in the phone book Yellow pages. 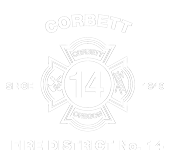 For the more adventurous, Do-It-Yourselfers can borrow cleaning brushes from the Corbett Fire Station, any Monday night between 6:30 and 8:00 PM. It’s a dirty job, but somebody’s got to do it – we’ve got the tools to help! For more information call 503-695-2272. Fireplaces and wood stoves are designed to safely contain wood-fuel fires, while providing heat for a home. The chimneys that serve them have the job of expelling the by-products of combustion – the substances produced when wood burns. These include smoke, water vapor, gases, unburned wood particles, hydrocarbon, tar fog and assorted minerals. As these substances exit the fireplace or wood stove, and flow up into the relatively cooler chimney, condensation occurs. The resulting residue that sticks to the inner walls of the chimney is called creosote. Certain conditions encourage the buildup of creosote. Restricted air supply, unseasoned wood and, cooler than normal chimney temperatures are all factors that can accelerate the buildup of creosote on chimney flue walls. Air supply may be restricted by closing the glass doors, by failing to open the damper wide enough, and the lack of sufficient make-up air to move heated smoke up the chimney rapidly (the longer the smoke’s “residence time” in the flue, the more likely is it that creosote will form). A wood stove’s air supply can be limited by closing down the stove damper or air inlets too soon or too much. Burning unseasoned wood – because so much energy is used initially just to drive off the water trapped in the cells of the logs– keeps the resulting smoke cooler, than if seasoned wood is used. In the case of wood stoves, overloading the firebox with wood in an attempt to get a longer burn time also contributes to creosote buildup.